Across Canada, Gold Seal Projects are showcasing the value of Gold Seal Certified professionals. Gold Seal projects are a reflection of experience, competency and excellence in the management of a construction project. 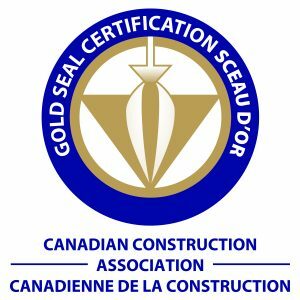 If you would like to gain additional exposure for your construction project and raise the level of your management staff’s professionalism, you should consider registering as a Gold Seal Project. In a Gold Seal Project, a construction company works with their local construction association and the Gold Seal Certification program to jointly promote Gold Seal as part of a construction project. The objective is to educate non-certified workers about Gold Seal Certification and to honor those who have earned their certification by the end of the project. Halifax Harbour Bridges embarked on a significant and necessary project in early 2015: the replacement of the suspended spans of the Macdonald Bridge. The bridge remains safe but after 60 years, the deck is wearing out and needs to be replaced. The project, also known as The Big Lift, aims to extend the life of the bridge and reduce maintenance. The work was done mostly overnight with several weekend bridge closures over the 18-month period. This is only the second time that the suspended spans of a suspension bridge will be replaced while keeping the bridge open to traffic. Watch the time-lapse video documenting The Big Lift.